It’s a common phrase to hear that in order “to understand another person’s perspective, we must walk a mile in their shoes.” Easier said than done, though, particularly with respect to understanding how an older person navigates society. How exactly is one supposed to actually walk in an older person’s shoes and really understand what aging means to the average consumer? While some “aging suits” that restrict movements have existed for a while, a new educational campaign by Genworth Financial has been developed using innovative technology to really educate us about the effects of aging. The program uses a specially designed suit to allow participants to experience first-hand how it feels to age. While wearing the suit, participants can feel what it is like to have arthritis, vision impairment, hearing loss, muscle loss, and more. 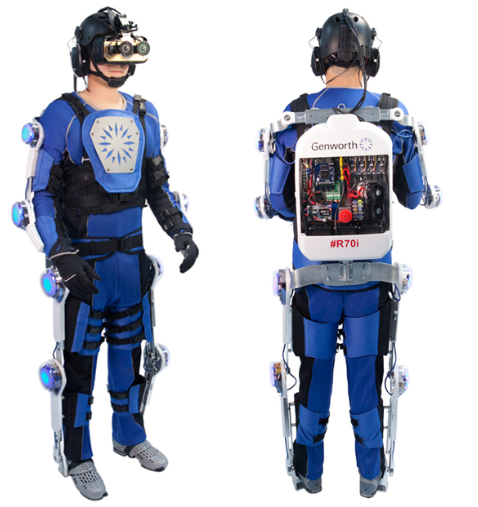 The suit has a motorized frame that restricts movement as well as a special headset that induces mental and physical restrictions such as hearing loss, tunnel vision, and more. Put it on and try to move, shop, prepare a meal, communicate, and exercise. Not so easy when one is 70+ years old. The goal: Build empathy and awareness. By walking in someone else’s shoes, we can indeed better understand their world. Poll students. What do they really understand about aging and what it means to business and marketing? Poll students: What are the common effects of aging? Divide students into teams. Have each team address how marketing could resolve one of the identified aging problems.